forthcoming events from Ipswich Arts Association and its members. 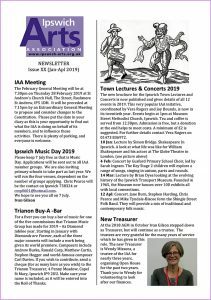 Distributed throughout Ipswich and the wider surrounding area, the IAA Newsletter is available from Tourist Information Centres at Ipswich, Felixstowe and Woodbridge, main libraries, local venues, public spaces, and from IAA member organisations. Event details for the newsletter are taken from the IAA website. Any event listed on the IAA website prior to the copy deadline will automatically be included in the following edition of the Newsletter.